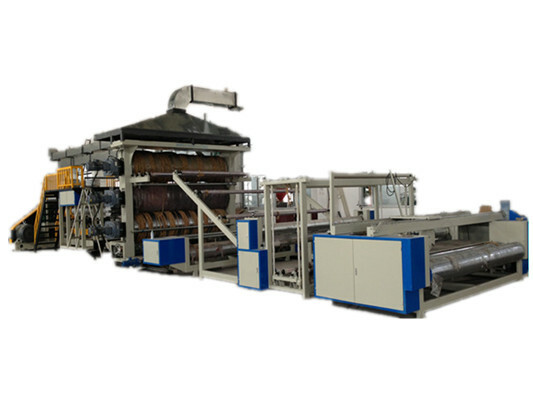 This machine uses flow casting techniques to thermally extrude polyethylene or polypropylene through calendaring and cooling links into sheet(or roll material).It can also laminate with Nonwoven Fabric, woven cloth as base fabric to produce geo-textile. This kind of fabric has good waterproof and barrier properties, and is widely used in construction and decoration, road and bridge construction, civil engineering and other fields. The machine has high degree of automation and convenience, and high output. Final products have smooth surface, stable performance and strong durability. If you have any question about the waterproof Sheet Production Line, please contact us directly. We will reply you as soon as possible. We are willing to take you to visit the factory. Looking for ideal Waterproof Sheet Machine Manufacturer & supplier ? We have a wide selection at great prices to help you get creative. All the Waterproof Sheet Line are quality guaranteed. We are China Origin Factory of Waterproof Sheet Product. If you have any question, please feel free to contact us.